April 13, 2011 - Coast Guard aircrews at Air Station Barbers Point, Honolulu received the second of four new multi-mission helicopters Saturday. The MH-65 Dolphin helicopter, closely resembling an HH-65 Dolphin, includes a multitude of new equipment to further enhance mission capabilities. The new aircraft are replacing the four Dolphins currently in service at the air station. The MH-65 adds new communications systems to an already capable platform. Such improvements include satellite communication capability and the ability for an aircrew to communicate with federal, state and local law enforcement and emergency services. These upgrades greatly increase the Coast Guard?s ability to cooperate with local agencies throughout the Hawaiian Islands in the event of an emergency. The MH-65 can accommodate a pilot?s head-up display and night vision optics to enhance the aircrew?s ability to operate around the clock. 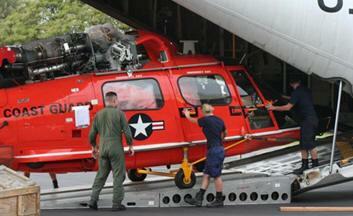 ?The MH-65 is really going to enhance the way we operate throughout the Hawaiian Islands,? said Lt. j.g. Jason Gross, an MH-65 pilot stationed at Air Station Barbers Point. ?We will now be able to much more easily communicate when we are working with our partner agencies, whether they be local law enforcement, fire departments, or military. Overall, I believe this helicopter is a great asset and will help us do great things here in Hawaii.? Additionally, the new and enhanced DF-430 adds the capability of the helicopter to direction find on 406 MHZ Electronic Position Indicating Radio Beacon signals, allowing quicker location of distressed mariners. Two more MH-65?s are scheduled to arrive in May, making Air Station Barbers Point?s helicopter fleet a complete MH unit. The Eurocopter HH-65 Dolphin is a twin-engine, single main rotor, MEDEVAC-capable Search and Rescue (SAR) helicopter operated by the United States Coast Guard (USCG). It is a variant of the French-built Eurocopter AS365 Dauphin. The SA366 G1 Dauphin version was selected by the United States Coast Guard in 1979 as its new short range recovery (SRR) air-sea rescue helicopter, replacing the Sikorsky HH-52A Sea Guard. In total 99 helicopters, optimized for the USCG's search and rescue role tasks and given the designation HH-65A Dolphin, were acquired. The HH-65A is not able to perform water landings. The HH-65 normally carries a crew of four: Pilot, Copilot, Flight Mechanic and Rescue Swimmer. The Dolphin was manufactured by Aerospatiale Helicopter Corporation (now American Eurocopter) in Grand Prairie, Texas. Textron Lycoming (now Honeywell) built the Dolphin's LTS101-750B-2 turbo shaft engines in Williamsport, Pennsylvania, and Rockwell Collins manufactured the HH-65's electronic systems in Cedar Rapids, Iowa.